Well, there's no getting around it. We're moving, and it's time to pack. I can no longer procrastinate. The in-laws are arriving next week to help our two households pack things up. Since we don't currently have a guest room, we make space for Grandma on an air mattress in the girls' room and Papa Randy takes the couch. Usually, we just move the girls' cottage up against the bookshelf while Grandma is here. But, I figure that I've got to break it down at some point in the next couple of weeks so now is as good as time as any. Ah, the cottage. It's hard to believe that it has been 2 1/2 years since the girls got it for Christmas. Ella was not quite 4, and Lu was almost 1. Boy do they grow up fast! 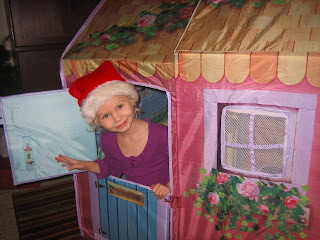 This sweet little cottage has brought hours of enjoyment to my girls and their friends. I'm just not mentally ready to part with it. Thankfully, the cottage and its many, many accessories break down quite nicely. I hope that their new bedroom in Virginia will have space for it. We're moving in two weeks, and we STILL don't have a lease for a rental. Hopefully that will be squared away in the next day or two...and hopefully, the girls will be able to keep the cottage. I want them to feel at home in our new home. Janel, I love your sister's blog(fishmama) and just discovered yours today. I live in Richmond, VA. Welcome! I love Williamsburg and hope you will feel at home there! Good luck on the move!